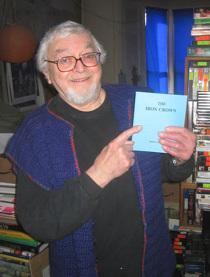 Home |Gallery |Russell Hoban in his workroom with a copy of "The Iron Crown"
Russell Hoban in his workroom with a copy of "The Iron Crown"
The images displayed on this website are included in good faith for the benefit of those interested in Russell Hoban. No users or maintainers of this site benefit commercially from their reproduction. All images are credited to the photographer and/or copyright holder where known and include a link where appropriate to the original website where they were found. Efforts have been made to locate the copyright holders and/or hosting websites and ask them if they have any objection to images being displayed here on this basis. Should there be any objection to any image being displayed on this website please contact us and we will remove it without hesitation.